I’m not willing to go that far. But after Donna Tartt’s The Goldfinch, I suspect it will be a long time before I read another novel that is as brilliant and beautiful as this one. In addition, it’s “wordy.” Full of fulsome descriptions. If you like a clean, simple, cut-to-the-chase style, Finch is not for you. If you’re not that interested in highly elaborate (but accessible) discussions of art, furniture restoration, what it feels like to be high or in love, to be terrorized, to be saved, to be lost, to be found, to be good, to be bad, to be human–go elsewhere. 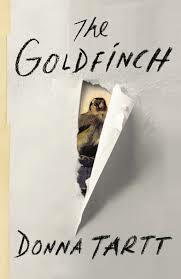 But if you want to have a reading experience that may make you wonder if you’ll ever want to read another novel, I recommend The Goldfinch. Why is it so great? You’re entitled to ask. I give it the highest marks—over the top—for its brilliant characterization; its brilliant sense of place (Manhattan, Las Vegas, Amsterdam); its brilliant plot (quite Dickensian, with one damn thing right after another! ); its brilliant description. Most of all the brilliant mind that conceived of and executed this book. How can one person know so much? Brilliant, brilliant, brilliant. I can’t begin to capture its brilliance here (not being brilliant myself). Let me just say that this was a book where I wished I could quote every line for you. Ever single line of 771 pages, and you wouldn’t be disappointed by a single one. Theo, the book’s extraordinary narrator, rescues this painting, a 17th century Dutch masterpiece, from the destruction caused by a terrorist bomb in the Metropolitan Museum of Art that kills his mother and nearly him when he’s thirteen. 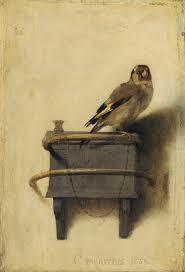 Follow this painting all through the novel. It will animate the highly suspenseful plot, but beyond that, it is the overarching vehicle for all this ambitious book takes on: love, loss, longing, obsession, friendship, and the power of art itself. In the process, The Goldfinch contains some of the most vividly detailed writing and richly drawn characters and relationships you’ll encounter in contemporary literature. There are plenty of others you have to meet—Theo’s mother, his father, Mr. and Mrs. Barbour, Zandra, Kitsey, Horst . . .
. . . I’m hoping there’s some larger truth about suffering here, or at least my understanding of it–although I’ve come to realize that the only truths that matter to me are the ones I don’t, and can’t understand. What’s mysterious, ambiguous, inexplicable. What doesn’t fit into a story, what doesn’t have a story. Glint of brightness on a barely-there chain. Patch of sunlight on a yellow wall. The loneliness that separates every living creature from every other living creature. Sorrow inseparable from joy . . .
It’s Theo’s incredibly intelligent, perceptive, sensitive, damaged consciousness that pervades the novel and makes it the brilliant book it is. We live through so much life, death, trauma, danger, disruption, obsession and passion with Theo that there’s the possibility of being wrung out emotionally. But for readers who give themselves over to Theo and embrace him and his story fully (as I did), you won’t be disappointed. If you’re like me, you’ll want to start reading it all over again. Not many novels come along that are this exceptional.